Two seasons ago I had Wisconsin and Duke 1-2 in my way too early preseason top 25. Last year I pegged North Carolina as the No. 2 team, but Villanova as the No. 11 team, so clearly I have some work to do this year to redeem myself. It is very college basketball that the day after the national championship game we already turn our eyes towards next season, but I suppose it does make sense given that college basketball has more turnover than any other sport. The obvious caveats that apply to the list below are: First, we don’t yet know where some recruits are going, most notably Josh Jackson. Second, we don’t know who all is going to the NBA Draft, and third, we don’t know if any impact grad transfers will commit to these schools over the summer. The Blue Devils will be the overwhelming favorite if Grayson Allen returns, but even if he doesn’t they’ll still have Jayson Tatum, Harry Giles, and Frank Jackson to headline an outstanding recruiting class, and 2015 McDonalds All-Americans Luke Kennard and Chase Jeter ready to take a big step forward. And don’t forget about Amile Jefferson, who likely will be eligible next season thanks to a medical redshirt. If Allen leaves and Giles hasn’t recovered from his injury issues, then Duke will take a step back, but they look to be the favorites in 2017. The Wildcats bring in a tremendous recruiting class led by Malik Monk, Bam Adebayo, and De’Aaron Fox. The worry with Kentucky is replacing Tyler Ulis and whether Calipari will get as attached to Isaiah Briscoe as he did the Harrison twins. I am not as high on Monk as some others are, but the collection of recruits heading to Lexington is incredibly talented. 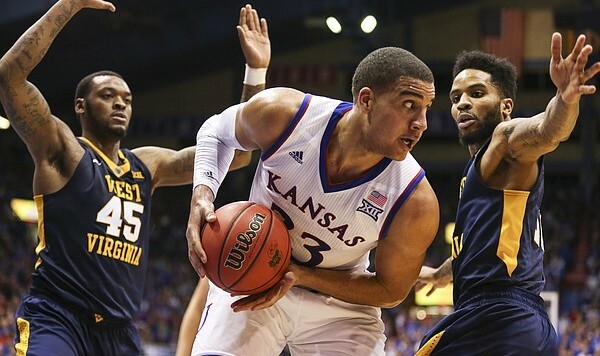 Perry Ellis and Wayne Selden are gone, but Frank Mason and Devonte Graham will be one of the best backcourts in the country, and Landen Lucas blossomed into one of the best interior defenders and rebounders in the country in the second half of the season. Kansas is one of the favorites for Josh Jackson as well, which would be a major coup for Bill Self. The champs lose Ryan Arcidiacono and Daniel Ochefu, but should return basically everyone else. Josh Hart had one of the more underrated seasons in America last year, and while Kris Jenkins will forever be known for that 3-pointer to win the title, he will provide plenty more of them next season. Omari Spellman will help replace Ochefu, but finding someone to do what Arch did will be much tougher. The Wildcats are in the running for both Josh Jackson and Terrance Ferguson, but even if they get neither, they still return Alonzo Trier and Kadeem Allen, and they add Rawle Atkins, Kobi Simmons, and Lauri Markkanen. Talent wise, Arizona will be right there with everyone. Even without Denzel Valentine, Michigan State will be very good. The Spartans could grab Josh Jackson, but even if they don’t they still get to bring in Miles Bridges, Cassius Winston, and Josh Langford, which is one of their best recruiting classes ever. It might take awhile to get rolling, but come March the Spartans should be a major threat. It starts to get a bit murky from here. The Ducks will probably return Dillon Brooks and Tyler Dorsey and if the Ducks get some better 3-point defense luck next season they should be in the hunt for another Pac 12 title. If Xavier gets Trevon Bluiett back it should contend for the Big East title. The Musketeers also get Norfolk State transfer RaShid Gaston to beef up the front court even more. I might be the high man on the Bruins, but Lonzo Ball is one of my favorite recruits and come March he should be one of the top guards in the country. He will be joined in the back court by Bryce Alford, one of the most underrated college players in the country (offensively anyway). Also watch for Aaron Holiday and Isaac Hamilton, who could give the Bruins the nation’s best backcourt. Like KenPom before he changed around his algorithm, I always buy into the Badgers. Everyone should be back for Wisconsin, and as a result it should have maybe the deepest team it has had in a decade.